Fancy a royal wedding? 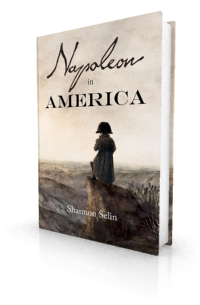 Napoleon Bonaparte and his second wife Marie Louise – the “good Louise” to whom he writes about their son in Napoleon in America – had three of them. They were married in a religious ceremony on March 11, 1810, though Napoleon was not present for the occasion. They then had a civil wedding on April 1 and another religious wedding on April 2. Here’s a look at the festivities. In December 1809 Napoleon ended his marriage to his first wife Josephine because she could not provide him with an heir. He had already started to look for a new, fertile wife among the royal houses of Europe. He expressed interest in Grand Duchess Anna Pavlovna of Russia, the youngest sister of Tsar Alexander I, but the Tsar and his mother opposed the marriage. Napoleon also considered Princess Maria Augusta of Saxony, but – at 27 – she was getting on in years. The French Emperor settled on Archduchess Marie Louise, the 18-year-old daughter of Emperor Francis I of Austria, head of the House of Habsburg. On learning that she had become that “poor princess,” Marie Louise submitted obediently to her father’s wishes (see my post about Francis I). Napoleon sent Marshal Berthier to Vienna to conclude the marriage on his behalf. On March 9, Berthier and Austrian Foreign Minister Clemens von Metternich signed the marriage contract, which was modeled after that of Louis XVI and Marie Antoinette. Marie Louise’s dowry, the equivalent of 500,000 francs, was presented to Berthier in rolls of gold ducats. Marie Louise formally renounced her right of succession to the Austrian crown. 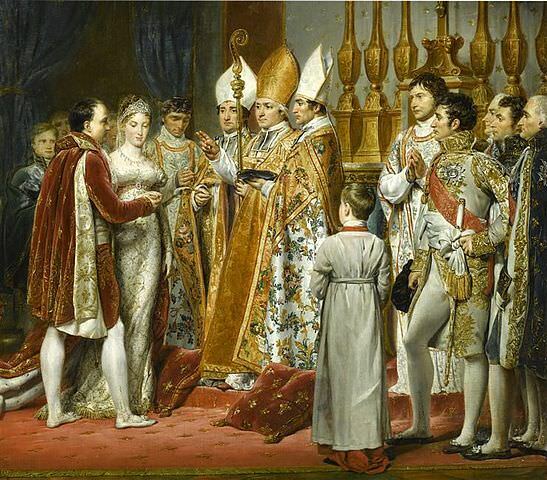 On March 11, 1810, Marie Louise married Napoleon by proxy at the Augustinian church in Vienna. Her uncle Charles stood in for Napoleon. Francis I held a grand banquet at the court. Free performances were given at all the theatres and there were illuminations through the city. Marie Louise was celebrated as the “new Iphigenia,” sacrificing her happiness for the good of her people. Two days later, Marie Louise left Vienna for Paris. She was accompanied by an Austrian entourage to the border between Austria and Bavaria. There, at Braunau am Inn, she was formally handed over to a French entourage that included Napoleon’s sister Caroline. Napoleon was waiting impatiently for Marie Louise in Compiègne. When her party neared the city on March 27, he rode out to meet them. He spent the night with his bride and they continued together to Paris. On Sunday, April 1, 1810, there was a civil wedding in the Apollo Gallery of the Château de Saint-Cloud. Imperial Arch-Chancellor Cambacérès presided. The entire court was present, filling the gallery and the Salon de Mars. Marie Louise was in full court dress and wore a crown set with diamonds. 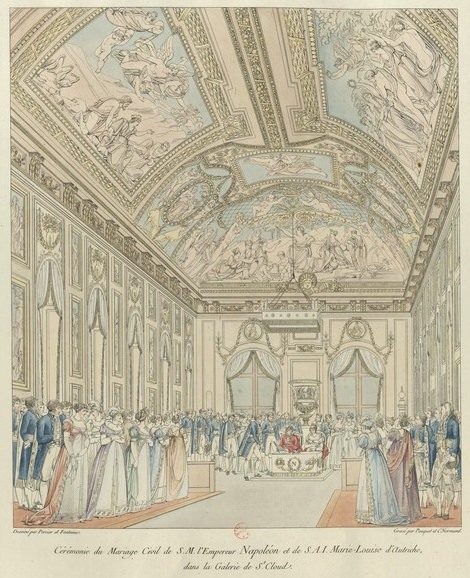 After the grand procession into the room, Napoleon and Marie Louise took their seats at the end of the gallery on two armchairs on a dais, surmounted by a canopy. At the foot of the dais, to one side, was a table covered with a rich cloth, on which were set an inkstand and the civil register. The vows (for which the couple stood) were straightforward. Sire, does your Imperial and Royal Majesty declare that you take in marriage her Imperial and Royal Highness Marie Louise, Archduchess of Austria, here present? I declare that I take in marriage her Imperial and Royal Highness Marie Louise, Archduchess of Austria, here present. The table was carried up to the royal couple so they could sign the register while seated. The marriage was announced with salvos of artillery at Saint-Cloud, repeated in Paris at the Invalides. After dinner, there was a theatre performance and the palace and park were illuminated. The next day, Monday, April 2, the imperial couple rode to Paris in a procession led by the cavalry of the Imperial Guard, followed by other horsemen and their bands, heralds of arms, and many carriages. 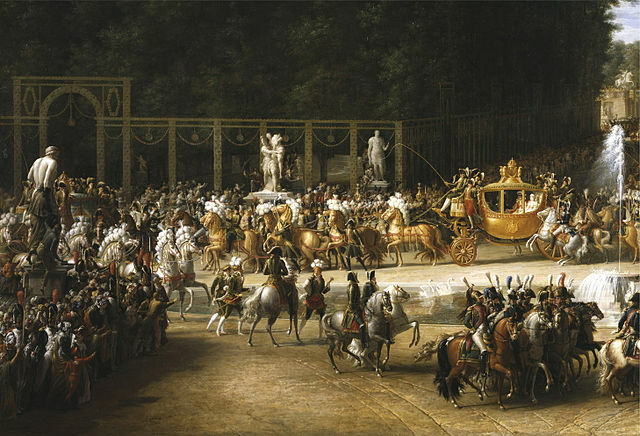 Napoleon and Marie Louise were in his gilded coronation coach, drawn by eight horses. They paused for speeches at the Arc de Triomphe. The bases of the arch, still under construction, were only about 20 feet high, but a full wooden mock-up had been hastily assembled and dressed in canvas for the occasion. The procession continued along the Champs-Élysées to the Tuileries Palace, where wedding guests had been kept waiting for about five hours in the Louvre. A chapel, complete with a silver-gilt altar, had been constructed in the Salon Carré. The Louvre’s director, Vivant Denon, protested in vain against the removal of paintings to make room for the seating. Napoleon’s uncle Cardinal Joseph Fesch presided over the religious ceremony. It is impossible to give any idea of all the grand preparations. In the great gallery of the Louvre, leading from the old Louvre to the chapel which is at the end of the pavilion of the Tuileries on the side next the Pont-Royal (the length of it is immense), there were three rows of benches to seat ladies and gentlemen. In the fourth row were fifty decorated non-commissioned officers placed at certain distances from each other with an iron rail in front, so as not to be pushed aside by the crowd. General Dorsenne…told the ladies that we were to serve as their knights, and have refreshments brought to them…. We each had to take charge of twenty-four on each side of us (forty-eight to each non-commissioned officer), and attend to all their wants. Large niches had been made in the thick wall to hold ninety-six canteens of all sorts of pleasant refreshments. These little movable cafés did a good business. The dresses of the ladies were as follows: low behind, down to the middle of their backs, and low in front so that you could see half of their breasts; their shoulders and arms bare. And such necklaces and bracelets and ear-rings! They were covered with rubies and pearls and diamonds. You could see every variety of skin: oily skins, skins like mulattoes, yellow skins, and skins like satin. The old women carried boxes containing a supply of perfumes. I must say that I had never before seen the ladies of Paris, half naked, so near. I did not like it. The men were dressed in French fashion, all wearing the same costume: black coat, short breeches, steel buttons cut in the shape of a diamond. The trimming of their coats cost eighteen hundred francs. They could not present themselves at court without this costume. Cabs being forbidden that day, it is impossible to imagine the number of splendid equipages in front of the Tuileries. The magnificent procession started from the château, and moved on to the Louvre, then mounted the grand stairway of the Louvre, and entered the chapel of the Tuileries. The ceremony was very imposing. The whole assembly remained standing, and the most solemn silence prevailed. The procession moved slowly. As soon as it had passed by. General Dorsenne called us together, marched us into the chapel, and formed us into a circle. We saw the Emperor on the right, kneeling upon a cushion decorated with bees, and his wife kneeling beside him to receive the benediction. After having placed the crown on his own head and on that of his wife, he rose, and sat down with her on a settee. Then the celebration of mass was begun…. Marie Louise wore the same crimson velvet cloak that Josephine had worn for Napoleon’s coronation ceremony in 1804. Her wedding gown was made of silver tulle netting, embroidered with pearls and lamé. Her white satin slippers, embroidered with silver, were too small for her and hurt her feet (for more details, see “Marie-Louise’s Wedding Outfit” on Napoleon.org). She also found the diamond crown uncomfortably heavy. Afterwards, Napoleon, taking Marie Louise’s hand, stood with her on the balcony of the Pavilion de l’Horloge, to watch the march past of the Imperial Guard. A banquet was given in the theatre of the Tuileries. Napoleon, Marie Louise and the imperial family sat at a horseshoe-shaped table. The rest of the court stood and watched them eat, in the style of the ancien regime’s grand couvert. A concert was held beneath the windows of the palace. This was followed by fireworks that extended the length of the Champs-Élysées (for more about the light display, see my article on illuminations and transparencies). Throughout the day, music, games, acrobatics and other entertainments were offered in the public squares, along with barrels of wine. Festivities continued until late in the night. 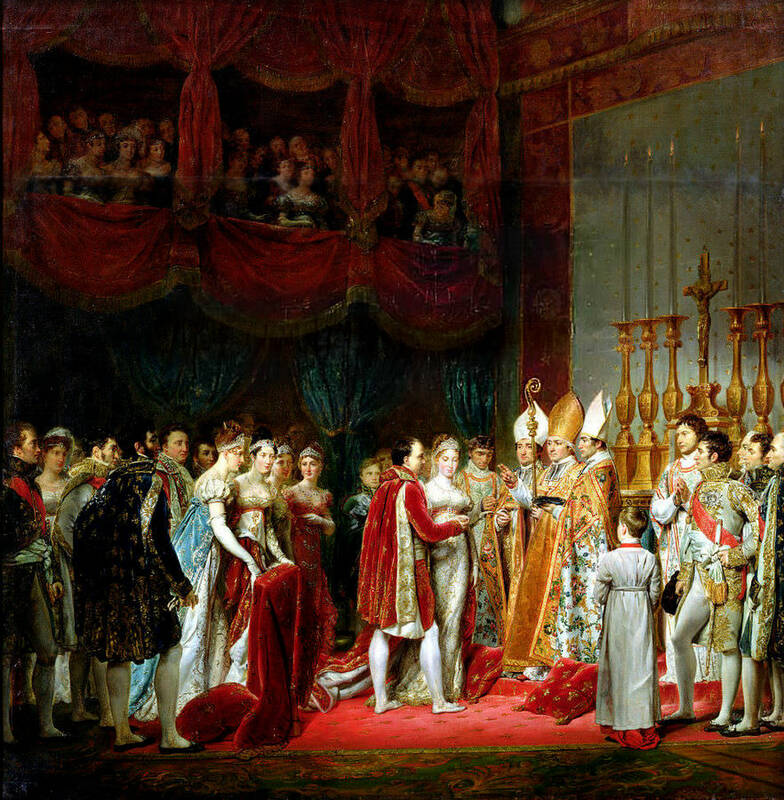 For Napoleon, the sole blot on the proceedings was that 13 of France’s 27 cardinals failed to attend the wedding. 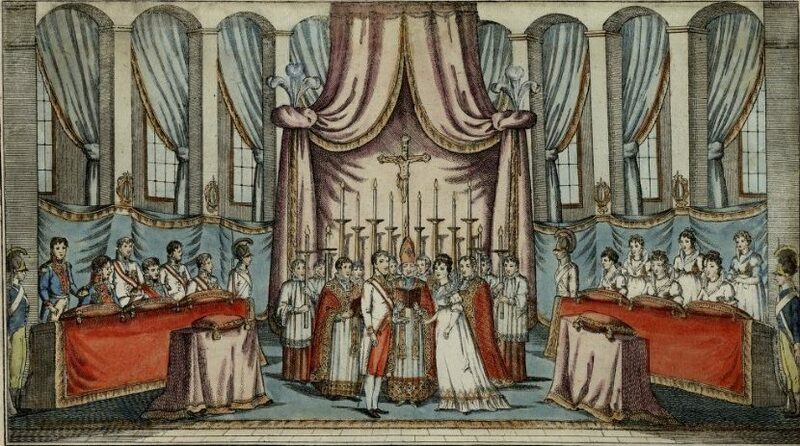 Their prominent empty seats drew attention to the cardinals’ doubt regarding the validity of the marriage, since Pope Pius VII had not declared Napoleon’s first marriage invalid. Napoleon stripped the offending cardinals of their robes, offices and estates, and told them to resume their attire as simple priests. They thus became known as the black cardinals. When they proved resistant to Cardinal Fesch’s efforts to reform their views, Napoleon had them imprisoned until the Pope was able to secure their release in January 1813. After so many weddings, one might wish the royal couple a long and happy married life. Sadly, this was not to be. Napoleon and Marie Louise spent four years together, then never saw each other again. For more on that, see my article about Adam Albert von Neipperg, lover of Napoleon’s wife. Correspondance de Marie Louise, 1799-1847 (Vienna, 1887), p. 143. Imbert de Saint-Amand, The Memoirs of the Empress Marie Louise, 2nd Edition (London, 1886), pp. 143-145. Louis Adolphe Thiers, History of the Consulate and the Empire of France Under Napoleon, translated by D. Forbes Campbell and John Stebbing, Vol. VII (Philadelphia, 1894), p. 68. Willem Lodewyk Van-Ess, The Life of Napoleon Buonaparte, Vol. VIII (London, 1813), p. 430. Jean-Roch Coignet, The Note-Books of Captain Coignet, Soldier of the Empire, edited by Jean Fortescue (New York, 1929), pp. 192-194. Thank you, Professor Kumar. It’s lovely to hear from you, and I’m glad you enjoyed the article. Thank you, the article is very good and detailed. I am very pleased to read this information & see the pictures. You’re welcome, Ayla. I’m glad you enjoyed it. Great article. I have an old coat that could have been worn on that day that I am trying to identify in a picture. It’s a livery coat. Anyway, great article. Thanks, Shane. That sounds like a wonderful coat. Glad you liked the article. Did Marie Louise go to St. Helena with Napoleon when he was exiled there? No. She stayed in Europe, took a lover, and became the Duchess of Parma in Italy. 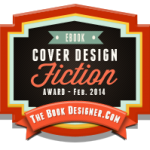 For details see: http://shannonselin.com/2015/01/adam-albert-von-neipperg/. Hi there, I have a pedigree chart that goes back to Napoleon and Princess Louise. It shows a son John Gordon (1820 – 1886) born in Scotland died in 1886 in San Francisco Ca. Can you shed any light on these facts? Hi Gerry, Napoleon and Marie Louise had only one child, Napoleon François Charles Joseph Bonaparte. He was born on March 20, 1811 and died on July 22, 1832. Marie Louise never saw Napoleon after January 1814, and neither of them ever went to Scotland. Marie Louise subsequently had three children with Adam Albert von Neipperg: Albertine Marie (born on May 1, 1817); Wilhelm Albrecht (August 8, 1819); and Mathilde (August 15, 1821). I have never heard of John Gordon. did marie louise renounce her title as empress of the french? Under the Treaty of Fontainebleau (1814), which stripped Napoleon of his powers as ruler of the French Empire, both Napoleon and Marie Louise were allowed to retain their titles of Emperor and Empress. The Final Act of the Congress of Vienna (1815), referred to her as “Her Majesty the Empress Maria Louisa” when giving her the duchies of Parma, Placentia, and Guastalla. I believe I have a wax seal ring that belonged to her. I’d like to speak with you more about it. Hi Steve, I have no expertise in Napoleonic objects. You might want to contact the Napoleonic Historical Society, as many of its members are expert collectors. It must be said that she was a beautiful sultana, that the Emperor looked very well pleased, and that her countenance was gracious.